Physical Description:  p., col. ill., 25 x 26 cm. After bedtime Little Nina refuses to go to sleep and gets into mischief while guests are visiting. 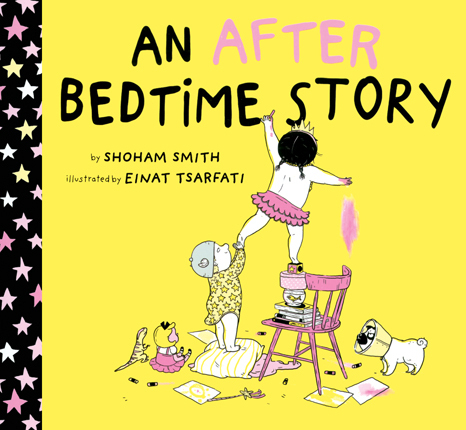 Booklist - 04/15/2016 When the usual bedtime fare doesn’t induce slumber, why not try an after-bedtime tale? Every parent will instantly recognize the angelic-toddler-turned-truculent-terror for whom sleep is just not a priority. Tonight, adorable, tiara-wearing Nina can’t sleep, not when there’s a party going on in her own house. Who can resist Aunt Ruth’s hugs and Uncle Saul’s pony rides? How can anyone pass up that dessert-laden cart? And as long as the baby brother has gotten up, too, everyone might as well party hearty! Translator Appel deserves kudos for managing to replicate the energetic rhyming verse of Israeli author Smith’s original Hebrew. As goofy fun as Smith’s text is, fellow Israeli Tsarfati deserves the crown (maybe when Nina finally falls asleep and renounces hers). Tsarfati’s attention to comical detail multiplies the adventurous humor, from the pet dog with his Elizabethan collar (what mischief did he commit?) and the wide-eyed doll that never expected a bath, to the revealing family photo gallery when Nina streaks down the hall. Bedtime’s for oldsters; let the children play. - Copyright 2016 Booklist.